UPPER EAST SIDE — Three neighborhood science powerhouses will soon be lab partners with a pharmaceutical company to speed up the discovery of life-saving drugs at a new research facility on East 69th Street set to open in the coming months, officials said Tuesday. 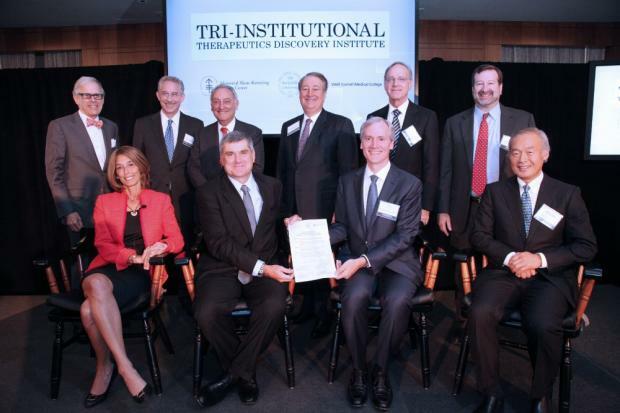 Memorial Sloan-Kettering Cancer Center, The Rockefeller University and Weill Cornell Medical College have formed the Tri-Institutional Therapeutics Discovery Institute, Inc. and will work alongside Takeda Pharmaceutical Company to develop molecules with medicinal potential. Because there's typically a divide between basic scientific research and clinical application, there's often a lag between a promising lab development and the next stages of drug creation, the leaders of the institutes explained. Under the new partnership, however, researchers from these institutions and Takeda will collaborate directly — in a soon-to-open research building on East 69th Street between York and First Avenues — streamlining the process, officials said. The research will range from diseases plaguing the developing world, including tuberculosis or malaria, to maladies most seen in developed countries, such as cancer and obesity. The number of scientists from each institution and Takeda have yet to be decided, officials said. The Institute was founded with two donations totaling $20 million, and it's expected to be operational as early as the winter 2014, officials said. Dr. Carl F. Nathan, chairman of microbiology and immunology at Weill Cornell and a leader of the partnership effort, said the neighborhoods' institutions have long aspired to speed up this process but hadn't been successful working without drug developers. "We didn't give them all the tools they needed. We gave them the education they needed, but not the opportunity to translate fully [their skills]," he said of their researchers. "It was sort of the relay-race model. You hand the baton off to the next sector, and they run away with it. It's just very inefficient." Dr. Marc Tessier-Lavigne, president of Rockefeller University, told DNAinfo New York that the new relationship between the institutions and Takeda will address this by bringing together the best of the scientific and business worlds — rather than maintain the relay. "We're all pooling our resources to really try to advance the discovery of therapeutics," he said. "It's going to be a team effort."